Pakistani Prime Minister Nawaz Sharif visits President Obama today at the White House amid cautious optimism that the rocky relationship between the U.S. and Pakistan may be improving. Still, with issues such as U.S. drone strikes, Afghanistan, and tensions with India on the agenda, the two leaders may find a lot to disagree about. Moreover, the suspicions that plague the U.S.-Pakistan relationship at the official level are also reflected in how the two publics view one another. Just 10% of Americans said the U.S. can generally trust Pakistan in a 2012 survey by the Pew Research Center, conducted in collaboration with the Carnegie Endowment for International Peace. Trust in Pakistan was also extremely low among the five groups of foreign policy elites included in the survey: government officials, retired military officers, business leaders, scholars and journalists. 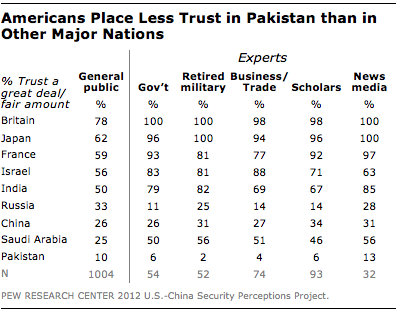 Americans trust Pakistan less than any other country tested on the poll, including Russia, China and Saudi Arabia. The low opinion appears to be mutual. Only 11% of Pakistanis have a favorable opinion of the U.S., the lowest percentage among 38 countries polled by Pew Research in spring 2013. President Obama gets his lowest ratings in Pakistan, where just 10% say they have confidence in him to do the right thing in world affairs. Key aspects of American foreign policy are unpopular there, especially U.S. drone strikes against extremist targets in Pakistan — 74% of Pakistanis say drone attacks kill too many innocent people. Other issues have not helped the relationship, such as the war next door in Afghanistan, and a perception that the U.S. sides with India in the long-running rivalry between the two nations. Still, many Pakistanis want a better relationship with the U.S. – a 47%-plurality say improving relations between the two countries is very important.